The original review of this book was posted on 10/07/2010. 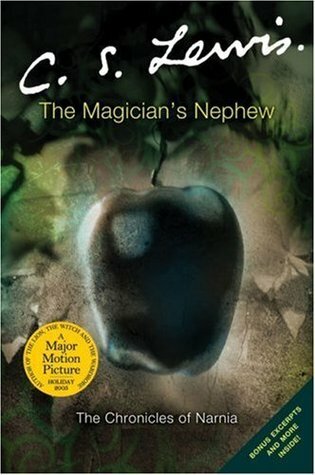 The Magician’s Nephew is the prequel to the famous Narnia Chronicles. It has been written in 1955, five years after the best known book in the series, The Lion, the Witch and the Wardrobe. It’s actually the first Narnia book I have read because I decided to read the books in chronological order. The story begins in London around 1900. Two children, Digory Kirke and Polly Plummer, meet while playing in the adjacent gardens of a row of terraced houses. They decide to explore an attic connecting the houses, but take the wrong door and surprise Digory’s Uncle Andrew in his study. The evil Uncle Andrew then sends Polly to a different world, and forces Digory to go after her. This is the beginning of a series of adventures caused by Magic. I kind of thought this book to be quite slow for a children’s book. Maybe it’s because I had the wrong idea when I started reading, but I wouldn’t read this book first. It is more about explaining where the Witch comes from and how Narnia took shape than that it’s an enjoyable stand alone story. It takes way too long before we finally arrive in Narnia, and when we do, we see more of the environment (which is quite okay) than of the inhabitants (which are way more interesting). This book did have some brilliant moments (like planting the Uncle.. I actually giggled at that part), and I didn’t found the Christian references troublesome at all. They gave the story a nice classic mythological touch that I liked. And of course, in the end, everything works out. (Except for the Witch problem, we still need her in the next book). It has potential, and I hope The Lion, the Witch and the Wardrobe proves to be the real classic it is labelled as. I honestly remember very, very little of this book. Admittedly, it has been nearly four years since I read it, but I feel like it should have been more memorable. My first foray into the world of Narnia was disappointing, and I haven’t ventured back since. I’m honestly considering to just see the movie instead of reading the rest of the Narnia stories in my copy. When Digory and Polly are tricked by Digory’s peculiar Uncle Andrew into becoming part of an experiment, they set off on the adventure of a lifetime. What happens to the children when they touch Uncle Andrew’s magic rings is far beyond anything even the old magician could have imagined.